Lamy Turquoise ink is getting a reboot! Each year Lamy introduces a new color for the Lamy Safari and the Lamy Al-Star with a matching ink. The new colors for 2017 are the Lamy Pacific Blue for the Al-star and the Lamy Petrol for the Safari. The Lamy Petrol color is a new unique dark teal blue color but the new Lamy Pacific Blue color is very similar to the Lamy Turquoise Ink. 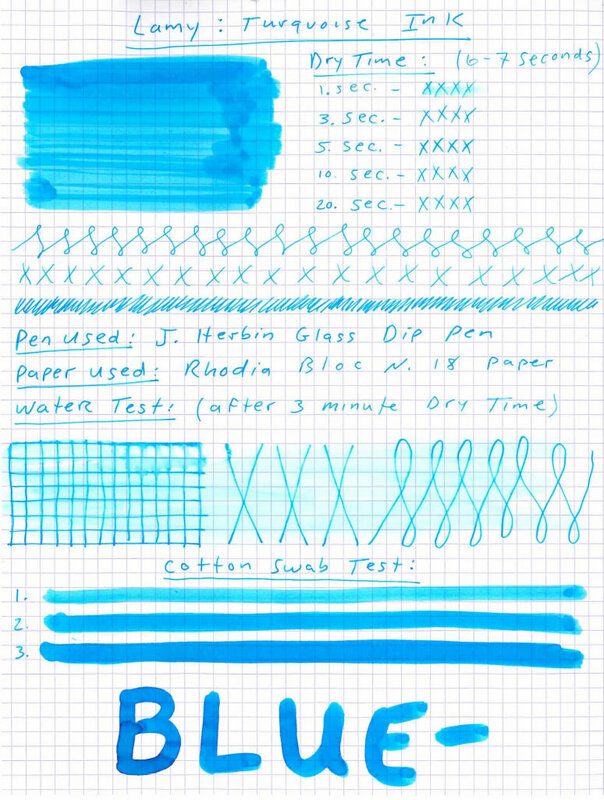 Lamy Turquoise is a nice bright shade of light blue turquoise. Lamy, which is a German company, produces some very innovated and functional German engineered pens and is one of the worlds most respected pen companies. Lamy’s ink is fairly inexpensive, innovative and come in a quite functional designed ink bottle. During this review, we used a J. Herbin glass dip pen on Rhodia bloc N. 18 paper. The glass dip pen has a tip equivalent to a fine nib. Innovative functionality is the theme for Lamy and its renowned German manufacturing. The Lamy ink bottle takes on these lofty goals. How innovative can you get with glass bottle? Well Lamy has come up with a unique design that is both innovative, functional, and just plain cool. The Lamy ink bottle contains 50 ml. of ink, is a large circular bottle, with a smaller glass bump at the bottom which serves as a built in internal ink well. The glass bottle is protected and surrounded by the plastic extension which serves as a holder for a thin roll of ink blotting paper to use when filling your fountain pen. German engineering doesn’t usually come this cheap. A bottle of Lamy 50 ml ink retails for just $10.50 and comes in 6 general colors (green, black, red, blue, blue-black and turquoise) as well as limited edition colors from time to time such as Pacific Blue and Petrol. Using the glass dip pen, we experienced a dry time between 6-7 seconds. Not super fast, but pretty reasonable. We didn’t experience any bleeding during normal use, however, with the ink soaked cotton swab, we did notice some slight bleeding, but only on the wettest part of the line. Using the Rhodia paper and glass dip pen, the lines were very clean and crisp. However, there was significant feathering, and bleeding, during the water test. We ran a soaking wet cotton swab over an ink sample that we let dry for about 3 minutes. The results were, pretty typical for water based dye ink. This is not waterproof or even water resistant. The ink bled a bit and there was significant ink smearing as well as some feathering. Not much shading was noticed using the glass dip pen, but with the right nib you may produce a some shading. Overall Lamy ink is a great value and the color matches the Limited Edition Lamy Pacific Blue. You get a large innovated glass bottle, functional ink, beautiful light blue turquoise color. We wouldn’t suggest Lamy Turquoise ink as a document or historical ink but a great ink that can be used daily as a writing ink. Try this great turquoise ink from Lamy! This entry was posted in Fountain Pen Ink and tagged fountain pen ink, Lamy, review on March 7, 2017 by Pen Chalet.